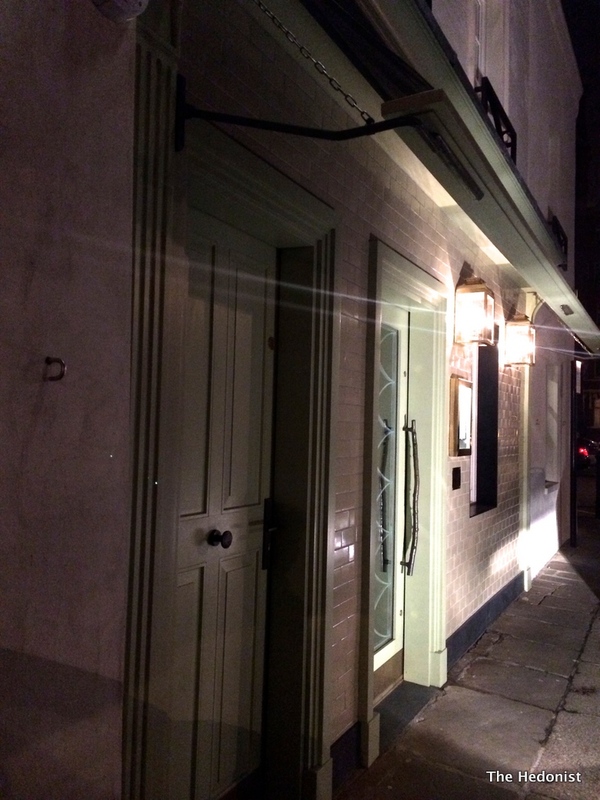 The restaurant is named after the 18th century Five Fields area of Chelsea. There aren’t any fields left thanks to Peter Jones et al but the rural link is tenuously sustained as the restaurant is supplied from Bonneyman’s parents’ kitchen garden in East Sussex. They are also Bonneyman’s main backers so let’s hope they can afford someone to do the digging. 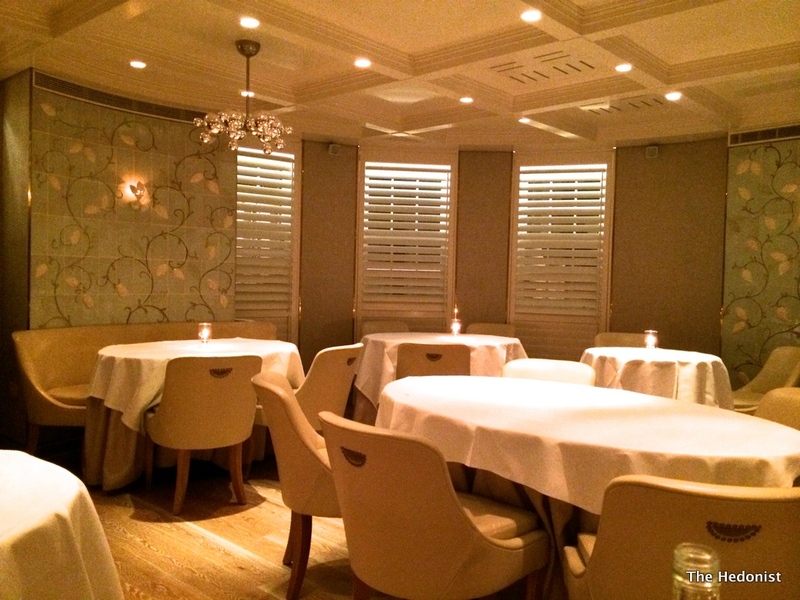 The room feels French bourgeois with floral decorative patterns on the walls and suits the comfortably upholstered locals of a certain age who are spending £55 per head for three courses or £80 for a tasting menu. Her Ladyship and I mixed and matched from the tasting menu with some options being vegetarian but including pre-starters you might expect around eleven plates of food. 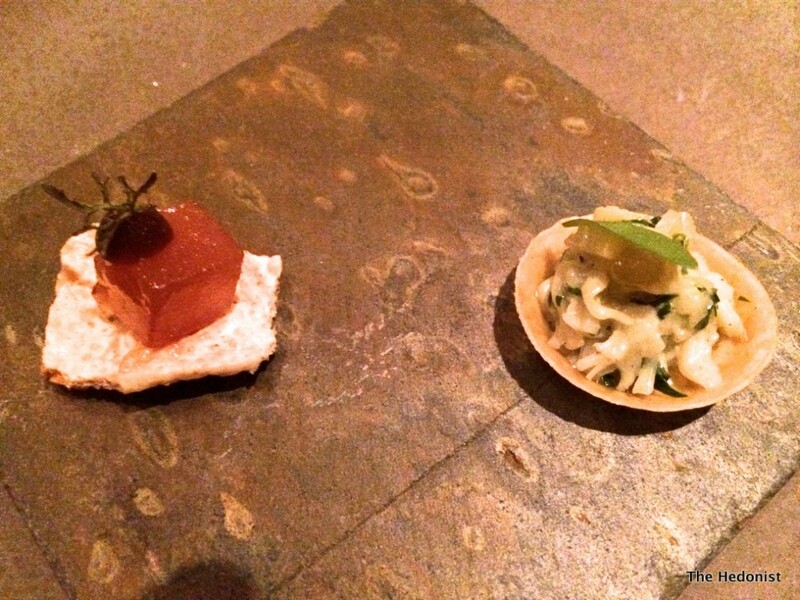 The pre-starters of a crab tartlet and some quince jelly on a bulgur wheat crisp were both intensely flavoured and very textural, setting a pattern for the meal to come-an impressive start. 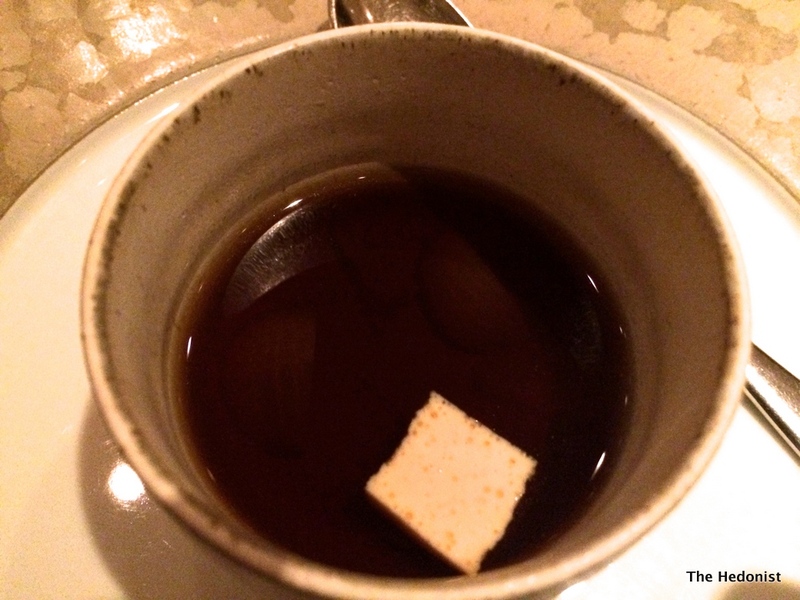 A bowl of onion consommé tasted like a pure distillation of onion, simultaneously sweet and savoury. Shellfish and potatoes-a wonderful seafood cream covered the fregola base.Smooth and rich-perfect for the clientele. 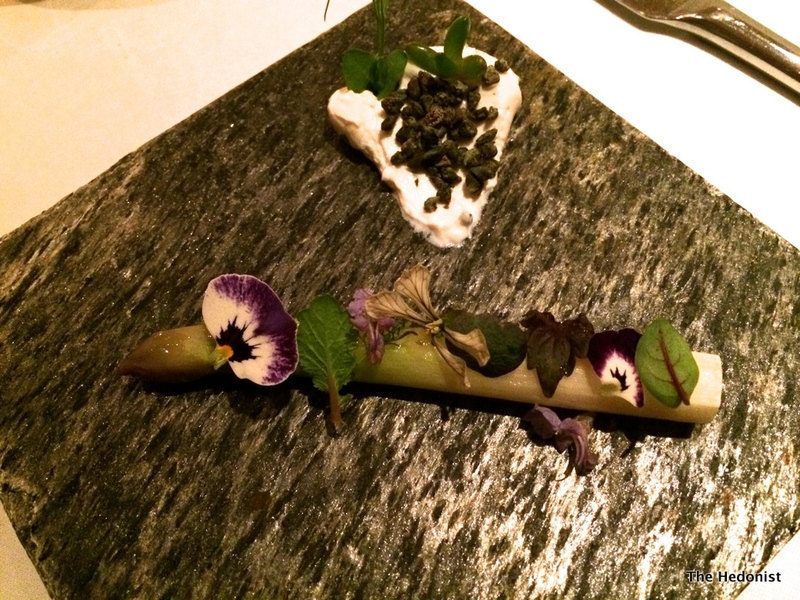 White asparagus is served with yoghurt and dehydrated capers. The flavour of the asparagus is offset by the lemon tang of the yoghurt. 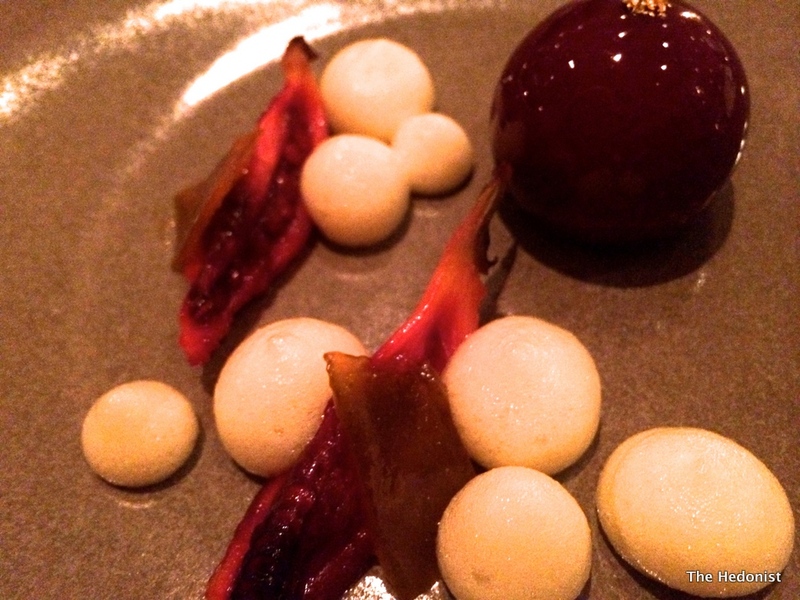 Foie gras with tamarillo and passion fruit foam was described as fantastic by her Ladyship who is notoriously hard to please. 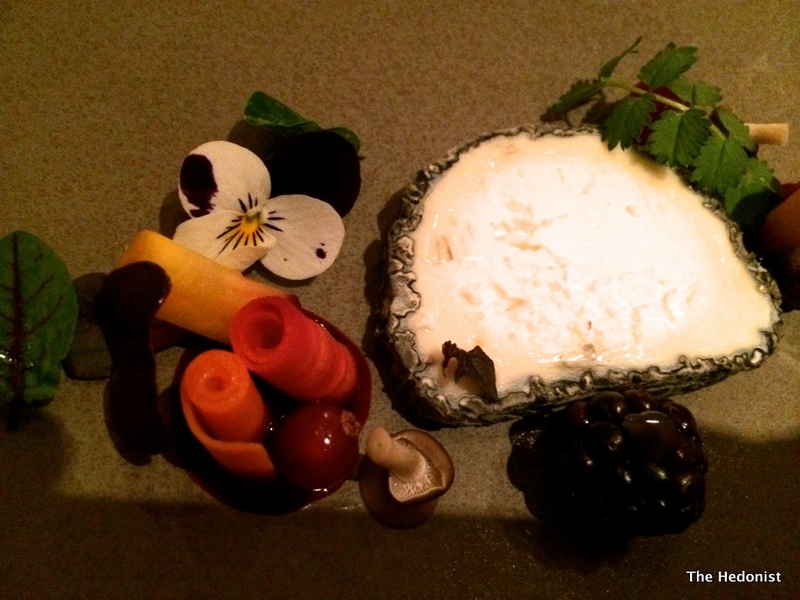 A crumbly goats cheese came with pickled carrot-a mix of crumble and crunch, with the rich flavour of the cheese cut through by the sweet pickled flavour of the carrot. 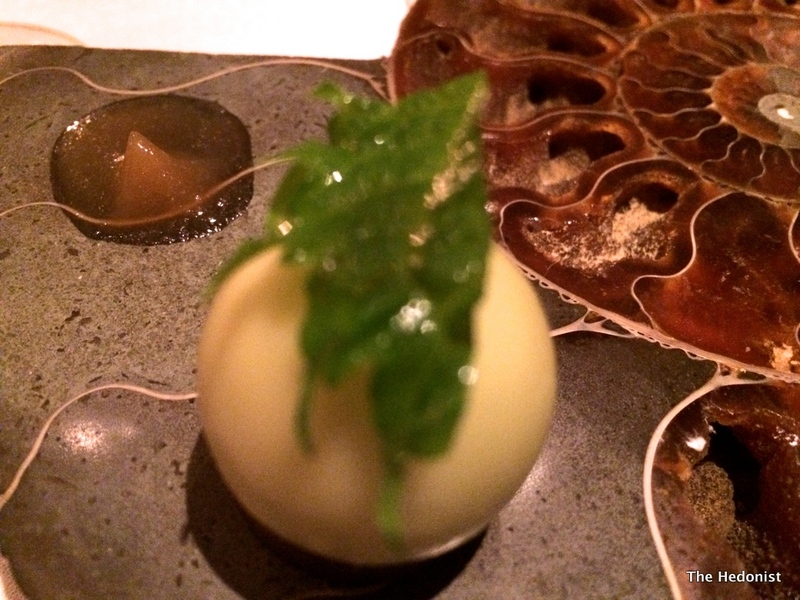 An apple and green shiso bonbon exploded in the mouth with the burst of citrus acting as a great palate cleanser. 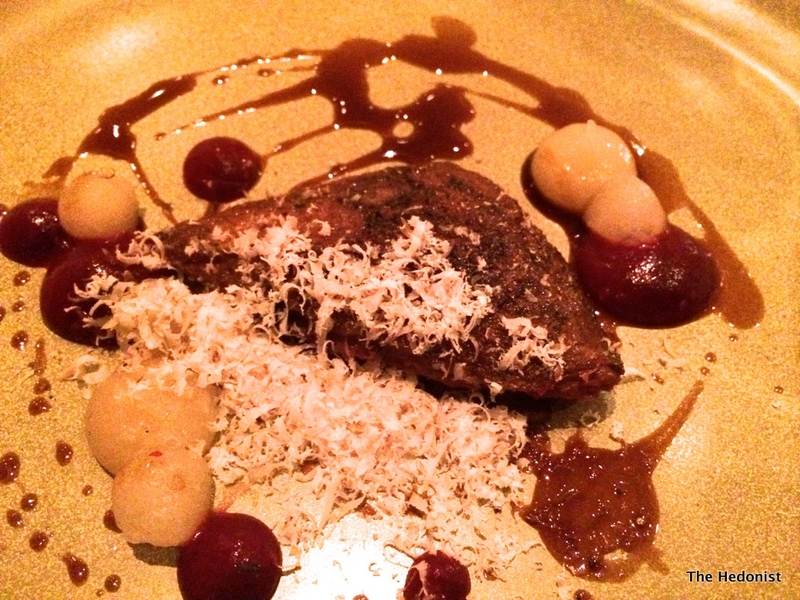 Pigeon, pear and cranberry was very tender and full of flavour. 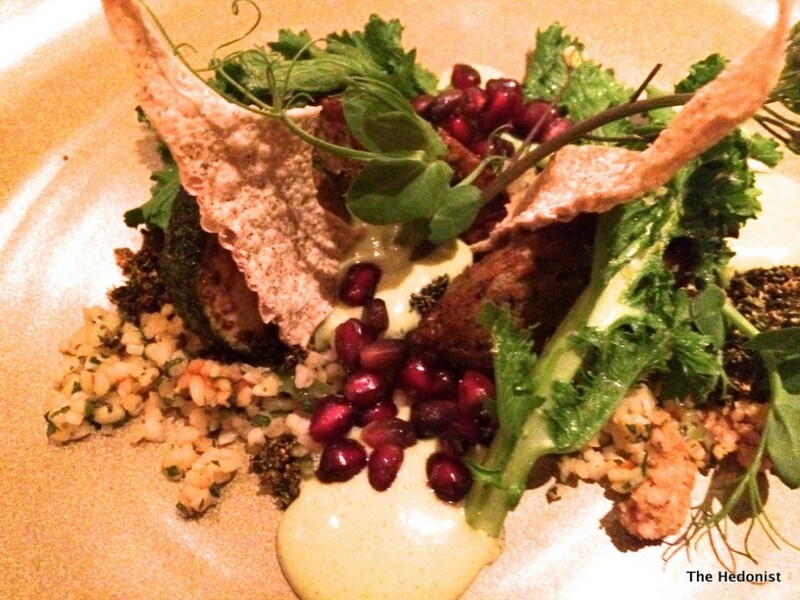 Falafel with pomegranate was deliciously spicy. 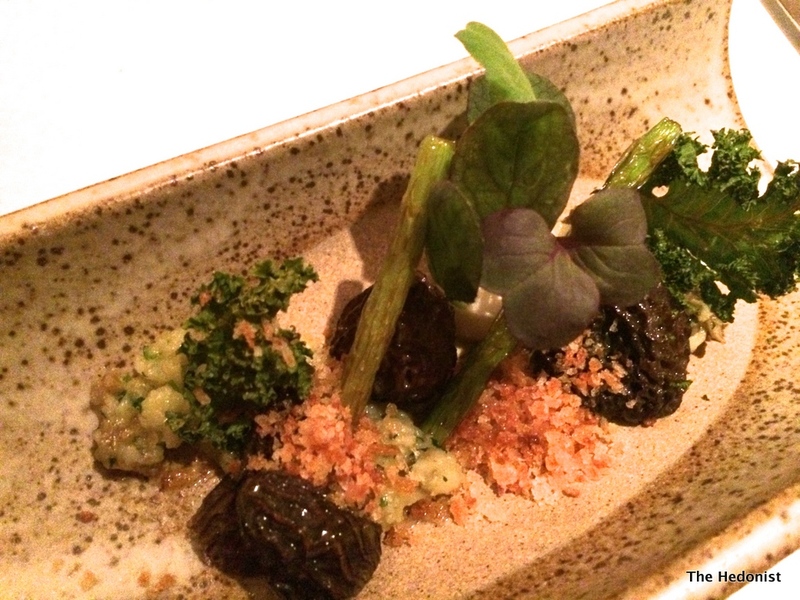 Roasted morels came with some crisp kale and an onion custard-this dish was a surprise, the kind of plate I would expect somewhere like Granary Store. 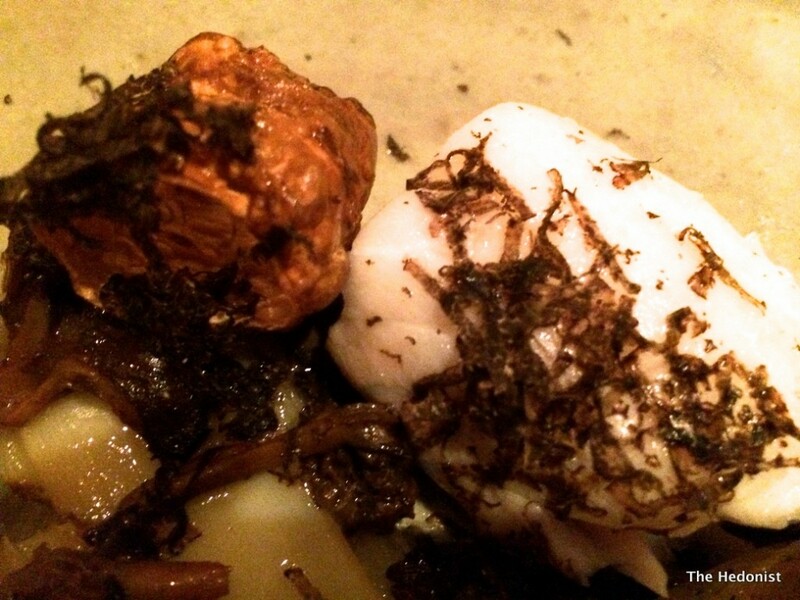 Translucent Cornish cod was served with shavings of Perigord truffle-a dish that epitomises the restaurant-perfect and precise cooking with great ingredients. For dessert we had a camarelised banana with a black olive guile-the salt of the olive contrasting with the sweetness of the banana, followed by a great chocolate mousse with a Muscat grape granita. 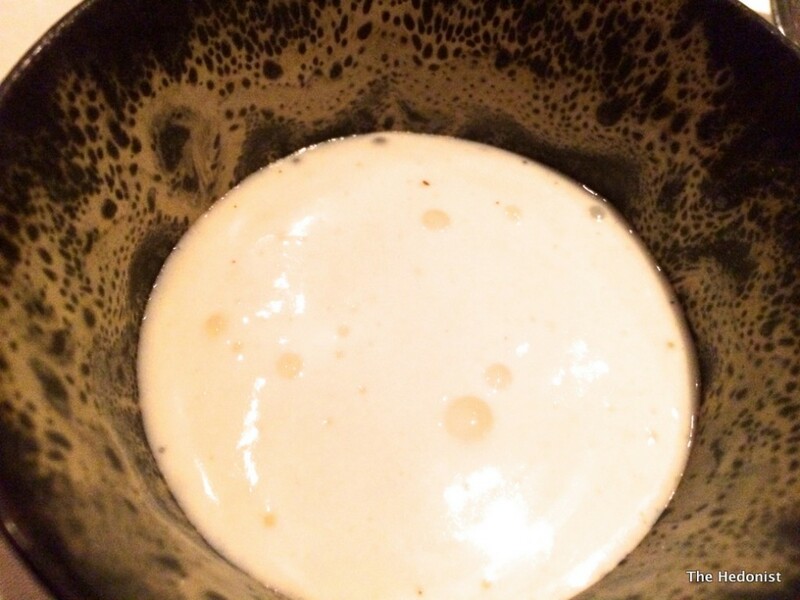 Our meal at The Five Fields was marked by an emphasis on textures and intensity of flavours, something that is sometimes is lost in the fine dining world. They don’t do a lunch sitting and are booked up 6 weeks in advance. If you are interested in fine dining you should go.